You may have noticed that I've been on a bit of a Scientology kick lately. I started with Leah Remini's Troublemaker, followed by Jenna Miscavige Hill's Beyond Belief, and most recently I finished Lawrence Wright's Going Clear: Scientology, Hollywood, and the Prison of Belief. Each book had it's upsides, but for the unincorporated lay person, I think Going Clear might be the most comprehensive look at Scientology of the three. 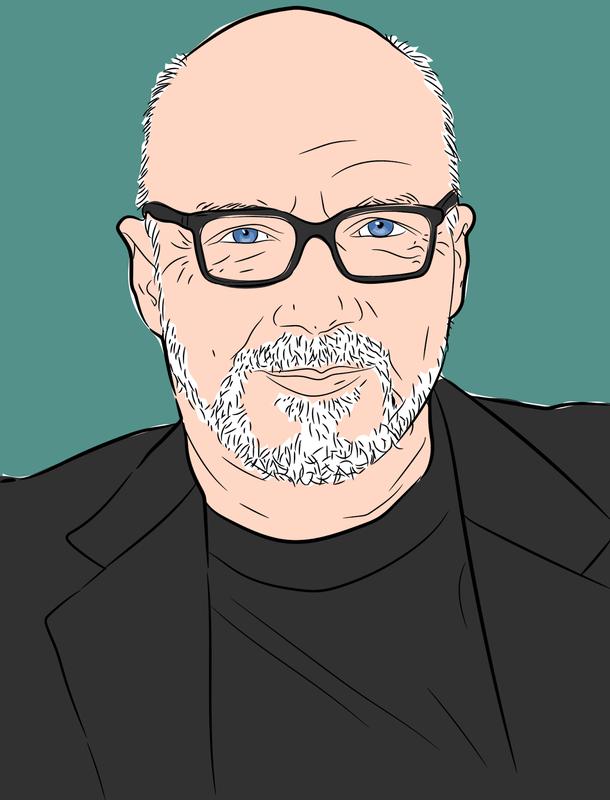 Today's Illustration is of filmmaker Paul Haggis. While Haggis did not write the book, the story of his experience with Scientology is prominently wrote throughout the pages. But, don't be fooled, there's a lot more to this book than just one celebrity's escape. The book offers an abridged history of Scientology and the life of L. Ron Hubbard, including footnotes where the story of an outsider differs from the official story given out by the Church of Scientology. Now, I'm not going to give you any spoilers form this book because I think you should read it. It's crazy. The things L. Ron Hubbard did in his life and was able to get away with are astounding. And I'm not just talking about creating a religion. He did all sorts of things and made up all sorts of lies, making lots of money in the process. One that comes to mind is that he actually wrote a book entitled All About Radiation, though he was not particularly any sort of authority on the subject. But then, I suppose anyone can write a book if they're willing to publish it themselves. Now, having a vague knowledge of Scientology, you might think, "how could anyone fall into this?" Well, I had the same questions, and that's why I read the books. I think there are several reasons, but one of them is that in the beginning the religion presents itself as a series of self-help classes. Who doesn't need a little self-help? Judging by the initial success of Dianetics, at least some of the techniques in Scientology might actually work. Of course, when you get deeper into the religion, there are some elements that are a little more, shall we say, far fetched than just self-help. One such practice which I think keeps people in the church is what they call "auditing." An auditing session is basically Scientology's version of Catholic confession, but there's the addition of a rudimentary lie detector, or "e-meter," as they call it. In auditing sessions, all admissions and confessions made are recorded in a person's "ethics file," or permanent record. If a person does not achieve the desired reaction from an e-meter in any given session, they might be asked to think of other things - perhaps even from past lives - to confess. In this way, a person's ethics file might contain all sorts of damning admissions that may or may not be true. So, leaving the church might endanger a person's reputation or even freedom. Most shocking of all - in all three books I read - were the accounts of working in the Sea Org. The Sea Org is a cloistered church-service organization that houses its members and essentially controls their lives. The church dictates everything from their meals and housing to marital status and reproductive rights. Though you may think I have summarized the entire book here in this post, there is so much more in Going Clear. If you like learning about this sort of thing, I highly recommend checking this one out.